We offer the finest in wood flooring! At Wholesale Flooring Center, we have a large selection of wood floors from the richly-grained exotic wood species to the distinctive North American hardwoods. Our hardwood flooring comes from some of the most respected wood flooring manufacturers. These floors will surely add beauty and charm to any room in your home for many years to come. Quality hardwood floors deserve a quality installation and Wholesale Flooring Center's trained installation crews will make sure your floors are installed correctly - we guarantee it! The rich look of hardwood floors adds warmth and charm to any room in the home. For centuries people have used wood floors in homes, churches and even stores. Through advancements in finish technologies and superior construction techniques manufacturers of hardwood floors are able to produce tougher finishes and more stable products. This means quality engineered hardwood floors can go in any almost room in the home and over a wide variety of subfloors, including dry, fully-cured concrete slabs. Today's hardwood flooring comes in a wide variety of wood species. Besides the popular and well known North American hardwoods (like oak, maple and ash) many companies now offer a variety of exotic hardwood species from all over the World. Exotic hardwoods offer unique and unusual visual character and give homeowners the chance to better express their personal decorating tastes with a more unique wood appearance. Another popular trend are the handscraped hardwood floors offered by hardwood manufacturers, such as Mohawk. If you want the rich look and charm of hand-made flooring than you won't want to miss previewing the hand-scraped hardwoods. Homeowners looking to use hardwood floors in their homes have the option of purchasing three different types of wood flooring. Although the end results may look the same there are distinct advantages for using each type under different applications. Longstrip Hardwood Floors - are really an engineered construction but with a long and wider plank. This allows the top layer to splice 2-3 rows of thin hardwood strips into one plank. Longstrip planks can be glued-down, stapled or floated over a wide variety of sub-floors and used almost anywhere in the home, including dry basements. Exotic Hardwood Floors - are used to described hardwood species from around the World. these hardwoods are not found in North America and come from Australia, Africa, Brasil and the Far East. 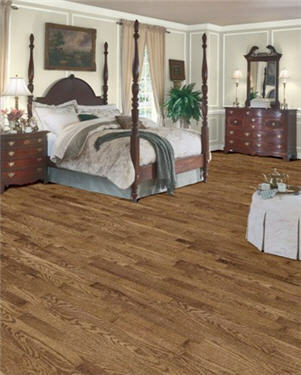 Exotic hardwoods offer unique wood graining and colorations. Most exotic floors are available in engineered wood construction but some are available in solid hardwood planks as well. Once installed it is extremely difficult to tell these different wood flooring construction types apart. Both the engineered and the longstrip have several thin layers (plies) of wood that are glued together. By gluing the plies together you get better dimensional stability within the plank itself, which allows these floors to be used on job sites that have a higher percentage of moisture content than normal. This includes basements and over concrete slabs where solid strip wood floors are considered off limits. Another choice you have to make is whether to want a pre-finished or an unfinished hardwood floor that has to be finished in your home. The pre-finished floors offer a wider variety of wood species and saves hours of labor and cleanup. While the unfinished wood floors allow you to have a really custom, job-site finish and a completely smooth, uniform surface. You also get an extended factory finish warranty with pre-finished floors, but not with most job-site finished flooring.